"Alan Catlin is a two-fisted reality writer who has walked the walk while producing grade A material from grade B movie plots and dialogue. His poems give serious critical weight to moviemaking myths and the people who create them. Catlin gets top billing on the Bijou theatre marquee as the leading man in the land of noir." Gene McCormick, author of Obsessions. 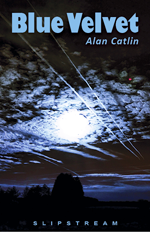 Alan Catlin has been publishing for the better part of five decades. During that time he has published thousands of poems in hundreds of magazines from the mundane to the outlandish to the well-known and everything in between. In his working life he was a barman, a profession he credits with warping his mind forever and giving him a unique perspective on life. He has published over sixty full length books and chapbooks including: Last Man Standing from Lummox Press, American Odyssey from Future Cycle Press and forthcoming, Hollyweird from Night Ballet Press, which also published his Beautiful Mutants chapbook. He is the poetry editor of the online poetry magazine misfitmagazine.net. were unfit for human habitation. did it make when they were dead? the street had to offer. as if they hadn�t felt a thing. rumored to explode after extended contact. painted the town red then burned it down. stargazing couple on clear night, no one believes. explanations or arguments over intent versus accident. days, now we are blinded by color.